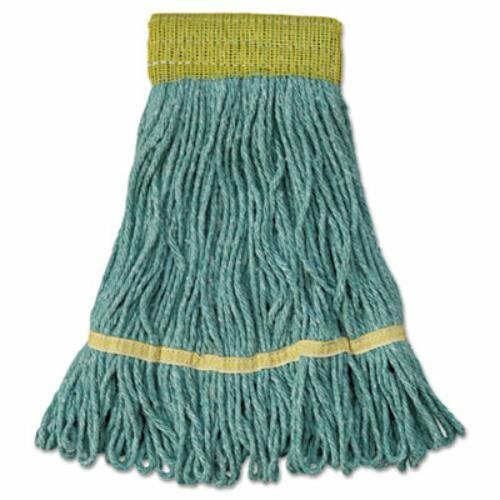 UNISAN Mop Head, Super Loop Head, Cotton/Synthetic Fiber, Small, Green, 12/Carton Premium-quality, four-ply cotton/synthetic yarn mop head for high-volume use. Absorbs up to seven times its own weight. Heavy-duty, 5" vinyl headbands. Launder in mesh bag. Use with clamp- or spring grip-style handles (sold separately). Head Type: Wet Mop; Application: Floor Maintenance; Mop Head Style: Looped End; Mop Head Size: Small. Heavy-duty, 5" vinyl headbands.